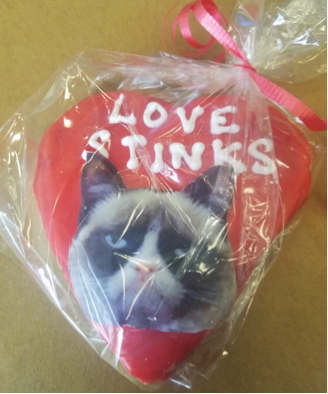 As a single mom and a bakery owner I’m often faced with a rush and request for the traditional Valentine’s Day baked goods. Cute cookies that say I love you. Cakes declaring love. And then, a rise of amusing requests for parties celebrating those that choose the single life. Over the past 3 years we have had a lot of requests for parties that are anything but traditional. Here is our recipe for a fun “Anti-Valentine’s” day party! Who doesn’t love grumpy cat? 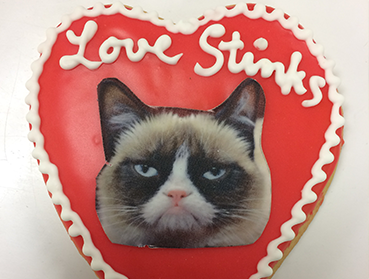 I thought our new Love Stinks cookies were awesome. Create your own version to celebrate what makes you laugh and what you love about life! Bring pictures of exes and shred them to make confetti. Pick a time in the evening to have a toast with champagne or a mocktail- and throw the confetti in the air like NYE. Banners, Funny Posters, & Smart Pants comics can make any event fun. Pick a theme- and go! Have your guests bring magazines and each person create a themed vision board. You can create the perfect partner, vacation vision board, or one about life- it’s up to you!